The Juno probe studying Jupiter snapped this image of the gas giant's clouds on Oct. 29, 2018. The Juno probe, which began orbiting our largest neighbor in July 2016, is laden with a host of scientific instruments designed to crack some of the gas giant's biggest secrets. But it also carries a camera, one that is directed based on public input. 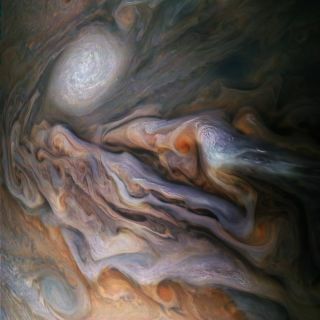 A photo of Jupiter's atmosphere taken by the Juno probe on Sept. 6, 2018, shows an anticyclone storm. On Twitter, NASA's Jet Propulsion Laboratory dubbed the atmospheric display a dragon's eye. The photo shows a region scientists have dubbed Jupiter's North North Temperate Belt. The large white oval is a type of atmospheric knot called an anticyclonic storm, which means that in the outer edge of the storm, winds are blowing in a direction that's opposite to the surrounding air mass. Smaller cloud structures are also on view. This isn't the only anticyclonic storm on Jupiter; a photo captured on Sept. 6 shows a similar structure in the gas giant's southern hemisphere. JunoCam also captures stunning planetwide shots as it flies away from Jupiter, like this one it snapped on Sept. 6, 2018. Earlier this year, NASA extended the Juno mission, with the probe now due to remain in orbit through the summer of 2021. However, that extension reflects the fact that the spacecraft was unable to maneuver into a shorter orbit, instead remaining on a wider orbit that has it skimming Jupiter only every 53 days. The extension will allow the spacecraft to complete the same number of orbits as originally scheduled.